single crochet, half double crochet, double crochet…. 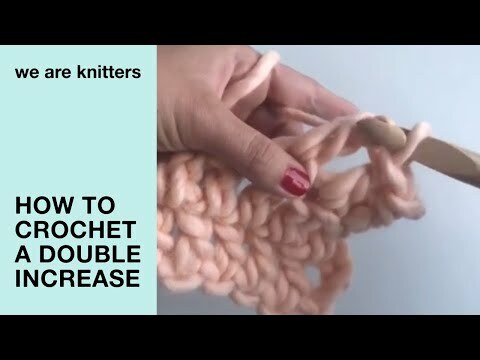 In this example we show you how to decrease in double crochet. Start to work a double crochet in the first stitch. Yarn over and insert the hook into the stitch. Yarn over again and draw the yarn through the stitch. You will have three loops on your hook. You will have two loops left on your hook. Leave this stitch unfinished with the two loops on the hook and start working the next stitch. Yarn over and insert the hook into the next stitch. Yarn over and draw the yarn through the stitch. You will now have four loops on your hook. Now you will have three loops on your hook. To finish the decrease, yarn over again and draw the yarn through all of the loops left on your hook. In this way the two stitches are closed together. You can make a decrease like this in any stitch, by leaving the first stitch unfinished in the last step, and closing the two stitches together at the end.